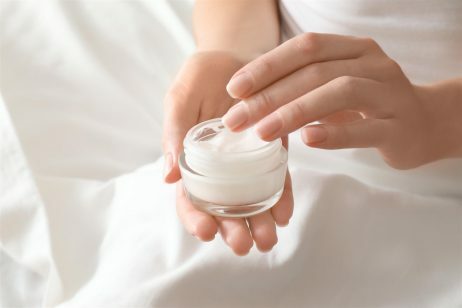 Cetyl alcohol is a fatty alcohol that functions as an emollient, emulsifier, thickener, and surfactant in a variety of cosmetics and personal care products. Cetyl alcohol was discovered in 1817 by the French chemist Michel Chevreul when he heated spermaceti, a waxy substance obtained from sperm whale oil, with potassium hydroxide. After cooling, flakes of cetyl alcohol were left behind. Thus, the name cetyl derives from the whale oil from which it was first isolated. However, since sperm whales are vulnerable to becoming an endangered species, cetyl alcohol is no longer derived from sperm whale oil. Modern production of cetyl alcohol is based around the reduction of palmitic acid, which is obtained from palm oil. This is why cetyl alcohol is also referred to as palmityl alcohol. There is also a method of producing cetyl alcohol from the end products of the petroleum industry. Cetyl alcohol comes in the form of a white, waxy solid. Cetyl alcohol has many functions in cosmetics and skin care products, including use as an emollient, emulsifier, thickener, and surfactant. As an emollient, cetyl alcohol has the ability to soften and smooth the scales of the skin, which helps to reduce rough, flaky skin. Emollients are also occlusive agents, which provide a layer of protection that helps prevent water loss from the skin. Cetyl alcohol also functions as a thickening agent, which can help to improve the viscosity of skin care products. Another function of cetyl alcohol is as an emulsifier. An emulsifier is needed for products that contain both water and oil components. According to EFEMA, when water and oil are mixed together and vigorously shaken, a dispersion of oil droplets in water – and vice versa – is formed. When shaking stops, however, the two phases start to separate. To address this problem, an emulsifier can be added to the system, which helps the droplets remain dispersed and produces a stable emulsion. As an emulsifier, cetyl alcohol consists of a water-loving hydrophilic head and an oil-loving hydrophobic tail. The hydrophilic head is directed to the aqueous phase and the hydrophobic tail to the oil phase. Cetyl alcohol reduces the surface tension by positioning itself at the oil/water or air/water interface, which has a stabilizing effect on the emulsion. Cetyl alcohol also functions as a surfactant. Surfactant is the short term for surface active agent. Surfactants are compounds that lower the surface tension between two substances, such as two liquids or a liquid and a solid. Another job of surfactants is to degrease and emulsify oils and fats and suspend soil, allowing them to be washed away. This is possible because while one end of the surfactant molecule is attracted to water, the other end is attracted to oil. Thus, surfactants attract the oil, dirt, and other impurities that have accumulated on your skin during the day and wash them away. Due to these properties, cetyl alcohol can be found in many different cleansers and body washes. Cetyl alcohol also increases the foaming capacity of non-aqueous (i.e. lotions) and aqueous solutions (i.e. shampoo). Due to its name, cetyl alcohol is often misunderstood to be bad for the skin since it is an alcohol. It is true that some alcohols, like ethyl or rubbing alcohol, can be extremely drying to the skin. However, quite the opposite is true for cetyl alcohol, which is well known to effectively condition and soften the skin and hair. The Food and Drug Administration (FDA) includes cetyl alcohol on its list of permitted food additives. The Cosmetic Ingredient Review (CIR) Expert Panel evaluated the scientific data on cetyl alcohol and concluded that this ingredient is non-sensitizing, non-toxic, and safe to use in cosmetic products. Even though the CIR Expert Panel considers cetyl alcohol to be safe for use in cosmetics, many dermatologists believe that this ingredient can be irritating for those with sensitive skin. According to Truth in Aging, many medical experts believe that cetyl alcohol, along with other synthetic fatty alcohols, have the ability to alter the lipid bilayer of the epidermis and cause allergic dermal reactions. With this information, it is best that those with sensitive skin or skin conditions like eczema, rosacea, or psoriasis perform a patch test with any product containing cetyl alcohol. References: Wikipedia, “Cetyl Alcohol”, Truth In Aging, “Cetyl Alcohol”, Dermcast.tv. 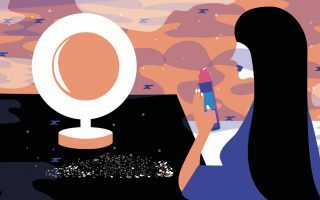 “Understanding the Difference Between an Emollient, Moisturizer, and a Humectant”, EFEMA, “What is an emulsifier?”, Paula’s Choice, “Surfactant”, FDA, “Synthetic Fatty Alcohols”, 2017, Cosmetics Info, “Cetyl Alcohol”.